There is is, right near the lamp post, a dog standing all by himself. 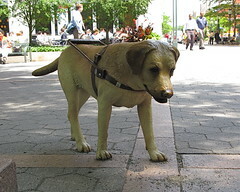 When you get closer, you can see by the harness he wears that he is a service dog, trained to help his disabled owner. But … where is the owner? And why isn’t the dog moving? 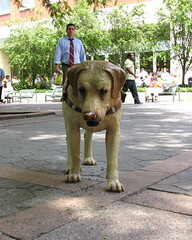 This is Stray Dog by New York-based sculptor Tony Matelli. 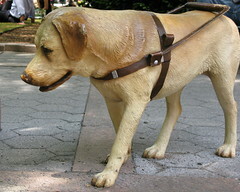 Lifelike and life-sized, created in resin, he stands beside the park at Brooklyn MetroTech center, baffling and delighting those who spot him and attempt to come to his rescue. I was astonished to see this high tech security lock installed on the exterior a small apartment building in Brooklyn Heights. It seemed so incongruous, a flashy, futuristic fixture in the center of an historic district. Have you seen locks like these on private homes? 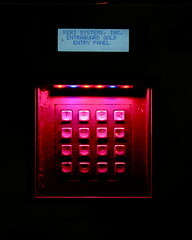 Would installing a fancy, new security system make you feel safer and more secure? 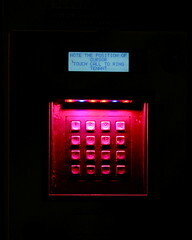 Keri Systems, Inc. Entraguard Gold entry panel. Note the position of cursor. Touch call to ring tenant. I did a double-take when I got a double view of the Statue of Liberty in Battery Park. Click on the photo for a larger image; note the cover of the book the sunbather is reading, and see its twin out in the harbor behind him. I’m so sad. I dropped in to see an old pal and found that he’d gone on vacation without telling me — or inviting me to come along. My only notification was a small sign he’d left at the door. 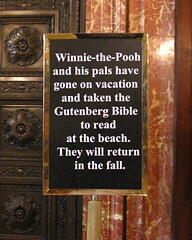 OK, actually, the sign is posted in the main branch of the New York Public Library in front of the room that has contained, among other treasures, the original Winnie the Pooh bear (the one that inspired the stories, films, cartoons and toys), his pals Eeyore, Piglet, Kanga, and Tigger, and a copy of the Gutenberg Bible. The room is now closed for renovations and the lovely people at the information desk have assured me that Winnie will soon be back in a new location. 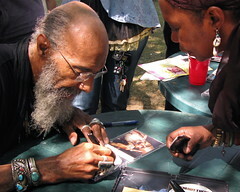 When makes his next public appearance, he will be residing in the new children’s division of the library. This sign was displayed on the sidewalk in front of a deli on 14th Street. 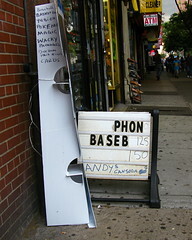 It seems like the store is selling something called phon baseb. Sounds as though it might be a tasty Vietnamese dish, but … perhaps not. Whatever phon baseb is, it’s a mystery to me. 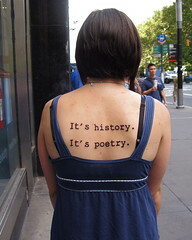 I was walking down Broadway when an unusual all-text tattoo caught my eye. I stopped to ask about it and learned that it had been applied only the day before at a strange little tattoo parlor on Manhattan’s Fulton Street. 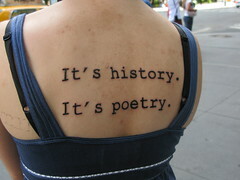 The tattoo’s wearer (owner? ), a Brooklynite from Park Slope, explained that the phrase is a quotation, spoken by the character Mr. Antolini in the classic American novel of disaffected youth, The Catcher in the Rye. “Among other things, you’ll find that you’re not the first person who was ever confused and frightened and even sickened by human behavior. You’re by no means alone on that score, you’ll be excited and stimulated to know. Many, many men have been just as troubled morally and spiritually as you are right now. Happily, some of them kept records of their troubles. 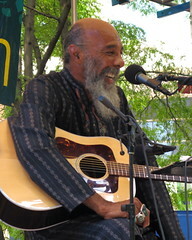 The final act of this year’s BAM Rhythm & Blues Festival at MetroTech was an appearance by the legendary folk singer Richie Havens, who was the opening act at the Woodstock Festival. 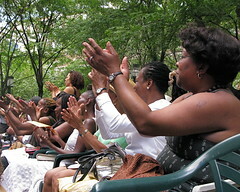 He grew up in Brooklyn, sharing a crowded Bedford-Stuyvesant house with nine siblings (“and one bathroom”), many of whom attended today’s outdoor concert in Downtown Brooklyn. 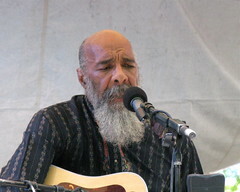 The 67-year old musician performed old hits (Freedom, Here Comes the Sun) as well as songs from his latest CD, discussed his passions, travels, and family, and frequently paused to say how delighted he was to be back home in Brooklyn. 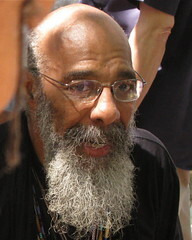 The crowd erupted in whoops and cheers whenever he mentioned a familiar Brooklyn landmark or street, and he described memories of local street corners and stickball. 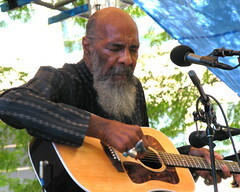 He was briefly joined onstage by Marcus Carl Franklin, with whom he appeared in the Todd Haynes film I’m Not There. 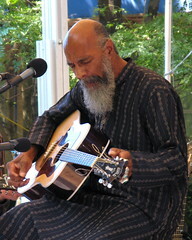 While Havens played, Franklin sang Tombstone Blues and When the Ship Comes In, the Bob Dylan songs he performed in the film, and topped it off with a spirited buck and wing. 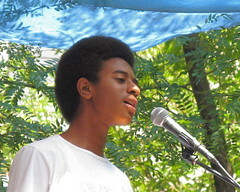 You are currently browsing the Blather From Brooklyn blog archives for August, 2008.